One of the most interesting aspects of interviewing music groups is finding out how the experiences of each member’s past informs the band’s sound and development as a cohesive unit. Every band has a unique origin story, and the Los Angeles foursome of Halo Circus is no exception. “We love what we do, and we do what we love. It just works,” adds guitarist Brian Stead. The night of multicultural music includes Halo Circus, Grammy-winning producer/songwriter Porter and his Cruzanderos, Heliotrope (featuring members of Ozomatli and WAR), David Garza and Project N-Fidelikah with Angelo Moore of Fishbone, George Lynch, Chris Moore and Pancho Tomaselli. The night before our interview, Matthew and Allison visited a Project N-Fidelikah videoshoot in North Hollywood. Before we delve into Halo Circus’ history, our waiter arrives to help us navigate the enormous menu of teas to be had at Chado. “You just had some dusty Lipton tea bags growing up in South Central,” jokes Matthew. 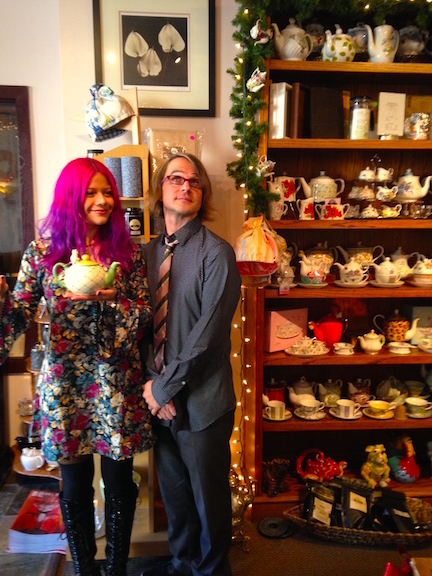 “This is so different for me, and I’m obsessed with this place because I like tea,” she adds. Matthew is also a fan of tea and opts for Chado’s best-selling Mauritius Black Tea from Africa and their signature Chicken Salad. Brian tries the Gyokuro Supreme Japanese green tea and a Souchong Chicken Sandwich. Allison loves brown rice tea, so she gets the Organic Japanese Genmaicha with Matcha powder and her favorite Smoked Salmon Salad, which Veronica also orders. For tea, Veronica and I both want to taste the Coconut Chai. A whole wall of the room is covered with tins of different tea varietals and adorable teapots for sale. The atmosphere is quite cozy, especially decorated for the holidays. After ordering, Matthew sums up the concept for Say It Loud. The Troubadour was the site of Halo Circus’ first show three years ago, so Say It Loud! is a homecoming of sorts for the band. To commemorate the experience, they’re releasing special “Countdown to Troubadour” videos on their YouTube channel. The first video is Allison singing “Mi Ranchito” on Olvera Street with Brian masked as Donald Trump. Ranchera songs were a staple in Allison’s home growing up in South Central Los Angeles, yet they are just a tiny sliver in the plethora of music that surrounded her. Although Allison fondly remembers attending her first concert, a Super Estrella radio festival at the Hollywood Bowl with Julieta Venegas and other Spanish pop/rock groups, she didn’t go to many shows at all. Ever since she was a little girl, Allison literally sang for her supper, performing at a furniture store each week before joining a wedding band at age 10. When she was 15, Allison moved to Mexico for three months to compete in Telemundo’s “Quinceanera: Mama Quiero Ser Artista” singing competition series, which she went on to win. The following year, she burst onto the world’s radar as a contestant on the eighth season of “American Idol,” eventually coming in fourth place. This led to the release of her debut album, Just Like You, in 2009. Meanwhile, her future husband and collaborator, Matthew, grew up in Texas – in a house where “Miles Davis was just as important as Fishbone, Billy Joel and Billie Holiday.” He played the piano and violin, which later enabled him to pick up guitar and bass without lessons, and after graduating from Berklee College of Music had to make the choice of where to move next. “It was a choice between New York and L.A., and at the time there was a very different sound and scene to each one. New York was a lot more aggressive, L.A. was more laid back. I like really aggressive music but I like really nice weather, so I decided to come out here and do really aggressive music,” he declares with a smile. His classical education and interest in diverse musical styles proved to be key in his successful career as a songwriter and music producer for the likes of Duran Duran, Scott Weiland, Simply Red, Mandy Moore and Mindi Abair. When Brian decided to move from his native Michigan to pursue music, he also chose between two cities: Chicago and Los Angeles. As a child, Brian remembers his dad playing a lot of Tom Petty and Neil Young, while his mom was really into the Police. In middle school, he started teaching himself guitar to Metallica and Nirvana songs. Veronica – whose earliest musical memory is singing along to every track on the Meet the Beatles! album with her parents when she was 4 or 5 – also remembers going through a distinct period when she realized she wanted to become a professional musician. “To go from that to Jeff Beck, I mean, nobody deserves to have her own band more than Veronica,” Matthew gushes. “Yeah, that was pretty fun, too,” she replies about playing with Jeff Beck. Five years ago Veronica moved to Los Angeles and eventually joined Halo Circus. Our pots of tea arrive, adorned with precious stoppers that are porcelain kittens. I nibble on a fresh-from-the oven blueberry scone and sip the aromatic Coconut Chai, as Matthew and Allison describe their initial meeting and formation of the band in 2013. Taking Allison’s cultural identity – as well as Matthew, Veronica and Brian’s diverse musical backgrounds – into account, Halo Circus evolved into the bilingual alternative rock band it is today. They are set to release their debut album that was mixed by Craig Bauer (Kanye West, Ed Sheeran, Smashing Pumpkins) in 2016, and Matthew wonders why anyone who has heard of the concept behind it would not want to give it a listen. “The album lyrically is a concept album from Allison’s perspective,” he says. “The more you get to know her past – that she grew up in South Central with parents from El Salvador (one legal and one not), made a living as a singer in second/third grade, lived in Mexico for three months and won a television show, did really good on another talent contest show and went on to have a solo album that sold 35,000 units in the first week – how could you not want to hear her perspective, the dichotomy of her existence? “You can’t help but smile when you see a bunny’s tail. The fact is, that tail was designed in order for giant hawks to see them; the cutest part of the animal is the part that ultimately poses the most danger. The duality of that seemed like a no-brainer,” adds Matthew. Halo Circus perform Dec. 14 at the Troubadour. For more information, visit facebook.com/HaloCircus.